How Much House Can I Afford with an FHA Loan? The Federal Housing Administration will only insure home loans up to a certain amount. These maximum lending amounts are aptly referred to as FHA loan limits, and they vary by county. In 2016, these limits range from $271,050 to $625,500. Mortgage lenders and HUD also have debt-to-income (DTI) requirements. When combined, these factors will determine how much of a house you can afford with an FHA loan. There is no single number or formula that answers your question. With that being said, most lenders today prefer to see a total debt-to-income ratio no higher than 50%. This means that if your total monthly debts (including the mortgage payment) use more than half of your income, you might not qualify. Some lenders set the bar lower, between 43% and 47%, and HUD encourages them to do so. Here’s a more detailed explanation of the concepts mentioned above. It will help you answer your question: How much house can I afford when using FHA? How Much House Can You Afford With FHA? There are several important concepts in the previous paragraph, and they all relate to your question regarding affordability. So let’s talk more about these three things, starting with those all-important loan limits. Each year, HUD announces the maximum loan sizes for FHA-insured mortgages. Sometimes the limits from the previous year are just carried over to the next, unchanged. Sometimes they are increased to reflect higher home prices. All of this is done at the county level. So if you want to know how much house you can afford with an FHA loan, you’ll want to start with the limits for your particular county. You can find them on the HUD.gov website or on LoanLimits.org. According to HUD, the maximum FHA lending amount for high-cost metro areas is $625,500, for calendar year 2016. In areas with lower home prices, the limit can be as low as $271,050. There’s a broad spectrum in between, so you have to find the limit for your county. It will affect how much house you can afford when using the FHA loan program. HUD also has certain guidelines for a borrower’s debt-to-income ratio, or DTI. As the name suggests, this is a comparison between the amount of money a person earns each month, and the amount he or she spends on debt-related expenses. You have a “front-end” debt to income ratio that only looks at your housing-related debts. You also have a “back-end” ratio that takes all of your recurring monthly debts into account. Mortgage lenders are mostly concerned with the back-end, or total, debt-to-income ratio. Many of them set the bar around 43%. This ties back to how much house you can afford with an FHA loan. If your total debts (after taking on the mortgage loan) would exceed 43% of your gross monthly income, you might have trouble qualifying for a loan. But this number is not set in stone. Some lenders allow higher DTI ratios for borrowers they feel are reasonably well-qualified. The table below shows the maximum qualifying DTI ratios for FHA loans. There are two numbers in each block, separated by a slash. The first number is the front-end debt ratio that only considers housing-related debts (i.e., mortgage payment). The second number is your back-end or total DTI that considers all debts (including car payments, credit card bills, etc.). How much of an FHA loan you can afford partly comes down to where you fall on this chart. As you can see, there are exceptions to the general 43% rule for debt ratios. 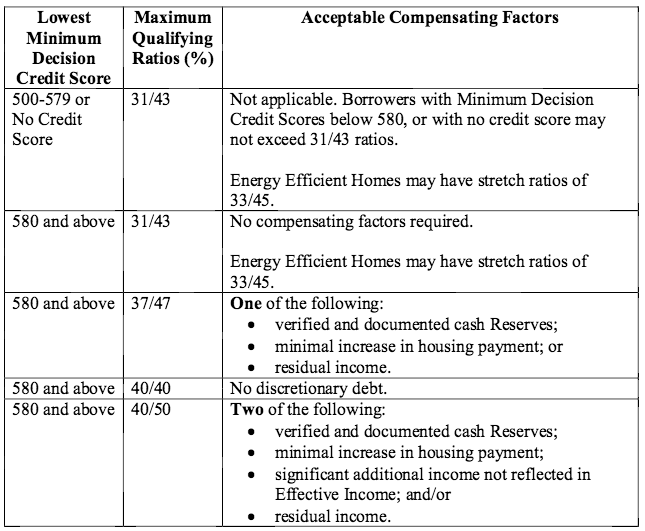 Borrowers with DTI levels higher than that could still qualify for FHA financing, if they have some of the “compensating factors” shown in the table. This table will help you determine how much of a home you can afford with an FHA loan. Last, but certainly not least, you should have your own housing budget on paper before applying for a mortgage loan. At the end of the day, you are the only person who can decide how much house you can afford. It’s also important to leave some money in the bank for an emergency fund. If you spend every last dime on your mortgage payments, you wind up being “house poor.” This means you cannot afford to do anything after paying your mortgage each month. That’s not a good position to be in, financially speaking. Some financial websites will give you a certain percentage of your income you should use for housing costs. For instance, many so-called “experts” suggest that you spend no more than 28% of your monthly income on a mortgage. But these are generalities that don’t apply to all circumstances. Every mortgage borrower is different. So every budget should be different to reflect the financial needs and lifestyle of the individual borrower. So I would take these percentage-based rules of thumb with a grain of salt. Do the math for yourself to see how much house you can afford with an FHA loan. Have a housing budget on paper before you start talking to lenders. And remember, you are the only one with your best interests at heart. Everyone else is trying to make money.